81 Commercial Real Estate & Properties in Milton are listed in 5 categories. We have 69 OfficesLease , 6 Retail ShopsLease , 4 Medical and Consulting PropertiesLease , 1 Other Commercial PropertiesLease and 1 Industrial Warehouses Lease . This tenancy provides plenty of natural light within a recently refurbished property in Milton: 580sqm level 1 Great selection of offices and open plan area Staff amenities including kitchen / breakout area Data cabled and ducted air conditioning throughout Lift access Signage Recently upgraded building 12 Secure basement car parking for staff and clients Easy access to a multitude of bus stops, Inner City Bypass, Riverside Expressway, Milton and Auchenflower train stations Located on the prestigious Park Road offering an abundance of cafes, restaurants, retail and amenities Please call Your Commercial to arrange an inspection. Approx. 310m2 fully fitted restaurant in place Operate straight away, no renovation time All the previous equipment is provided, including exhaust, cool rooms etc 3 basement car spaces included in rental plus more then 100 visitors off street Right next to the iconic La Dolce Vita at Savoir Fair Don't miss the opportunity to inspect today! Milton is an inner suburb of Brisbane, Australia, approximately 2 kilometres west of the central business district. The suburb is a mixture of light industry, warehouses, commercial offices, retail and single and multiple occupancy residences. The main roads are Milton Road, which runs beside the main western rail line and Coronation Drive, which runs along the Brisbane River. 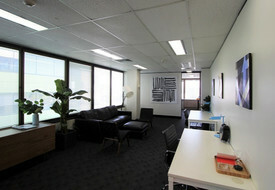 Approx 139m2 Commercial Office Space Great natural light with views over Milton. With reception area, 4 office, open plan area, boardroom and kitchenette Steps from Public Transport options (ferry, bus and Train) as well from Park Road restaurants and cafes High quality Office Building with End of Trip facilities, on site cafe and secure car parking Contact Marketing Agent today to arrange a inspection! Milton is a inner suburb of Brisbane, Australia, approximately 2 kilometres west of the Central Business District. The suburb is a mixture of light industry, warehouses, commercial offices, retail and single and multiple occupancy residences. The main roads are Milton Road, which runs besides the main western rail line and Coronation Drive, which runs along the Brisbane River. approx 281m2 Commercial Office Space Views that extend to from Mt Cootha to the CBD and Brisbane River Combination of 2 offices, fit out configuration is endless Steps from Public Transport options (ferry, bus and Train) as well from Park Road restaurants and cafes High quality Office Building with End of Trip facilities, on site cafe and secure car parking Contact Marketing Agent today to arrange a inspection! Milton is a inner suburb of Brisbane, Australia, approximately 2 kilometres west of the Central Business District. The suburb is a mixture of light industry, warehouses, commercial offices, retail and single and multiple occupancy residences. The main roads are Milton Road, which runs besides the main western rail line and Coronation Drive, which runs along the Brisbane River. approx 104m2 Commercial Office Space Glass frontage looking onto Coronation Drive Steps from Public Transport options (ferry, bus and Train) as well from Park Road restaurants and cafes High quality Office Building with End of Trip facilities, on site cafe and secure car parking Contact Marketing Agent today to arrange a inspection! Milton is a inner suburb of Brisbane, Australia, approximately 2 kilometres west of the Central Business District. The suburb is a mixture of light industry, warehouses, commercial offices, retail and single and multiple occupancy residences. The main roads are Milton Road, which runs besides the main western rail line and Coronation Drive, which runs along the Brisbane River. Approx 142m2 Commercial Office Space Views that extend to the CBD and Brisbane River Current configuration, reception, 2 office, open plan area, boardroom and large kitchen Steps from Public Transport options (ferry, bus and Train) as well from Park Road restaurants and cafes High quality Office Building with End of Trip facilities, on site cafe and secure car parking Contact Marketing Agent today to arrange a inspection! Milton is a inner suburb of Brisbane, Australia, approximately 2 kilometres west of the Central Business District. The suburb is a mixture of light industry, warehouses, commercial offices, retail and single and multiple occupancy residences. The main roads are Milton Road, which runs besides the main western rail line and Coronation Drive, which runs along the Brisbane River. Abundance Of Natural Light | Creative Space | Transport Close By $460pw | 4 Person Workspa..
PROPERTY OVERVIEW $460pw Price incl. Dedicated desks for rent in a Milton office that showcases floor to ceiling views of Brisbane’s fantastic mountains, river and cityscape. Beanbags, breakout areas and brilliant natural light – this newly renovated office space has it all and offers a relaxed place to create, innovate and thrive. The office has Wi Fi, whiteboards, a kitchen and all standard office amenities as it hits just the right mark between casual creativity and business professionalism. As if that’s not enough, you can impress your network by hosting conferences in the adjoining Milton House before letting work meet play with unlimited access to a tennis court, swimming pool and BBQ area. There are 10 desks for rent at this office which can be rented individually or together for great flexibility. Amazing perks at a low cost – this Milton office space is one of the best offerings in the area right now. Kings Row is a stunning Grade A development of modern light filled office space and world class facilities including bike racks, lockers, showers and changing rooms with a free towel service. It’s fully air conditioned for the comfort of its tenants and is accessible 24/7 so you can work when it fits in with your lifestyle. The five floor building offers direct access to Coronation Drive from the ground floor with a bus stop adjacent to the front door. It’s attached to the historical Milton House, the original homestead for the area dating back to 1850, which offers conference facilities, meeting spaces and incredible lifestyle facilities of a pool, tennis court and BBQ area. Located just 350m from Milton Station among Milton’s best cafes and conveniences and only 2.2km along the Bicentennial Bikeway to Brisbane CBD, this coworking office boasts a tranquil environment that’s still close to the action of the city. The advertised office space is perfect for a team of 4. If you need more or less space, we have over 30,000 furnished workspaces all over the world suitable for a team of 1 to 200+. Our award winning team offer a free service that will help you find the perfect solution for your needs, so reach out if you need more help. What you get for your weekly rent , 24/7 Access , Access to internal breakout areas , Access to kitchen facilities , Access to secure printer and scanner , Building outgoings included , Electricity usage included , FREE use of the meeting rooms , Lockable storage unit , One simple bill for everything related to your workspace , Plug and play furnished workspace , Regular cleaning , Secure high speed Internet Building features , Abundance of natural light , Air conditioning , Car parking in building (Paid) , Creative co working space , Disabled access and facilities , New fit out , Print, scan and copy facilities , Taxi / Uber stand close to building 350m to Milton Train Station 270m to Milton Markets 500m to Milton Ferry Terminal 2.2km to Brisbane CBD Close access to the Bicentennial Bikeway WHO IS OFFICE HUB? Office Hub has largest collection of shared office space, sublet office space, creative coworking office space and serviced offices, perfect for 1 200 employees. Let us take you on a tour of all the spaces that fit your needs and budget. Our service is complimentary and we work for you and the landlord to negotiate the most competitive deal in the market. Let us show you how shared and serviced offices can be the perfect solution for your business. www.office hub.com.au www.office hub.co.nz Conditions apply A portion of the square meterage factors in access to shared space. The advertised price includes any incentives offered based on a 12 month agreement. If a shorter period is agreed to please note the price may increase accordingly. This promotional offer for new tenants only and may be withdrawn at any time due to space availability. Entire Building opportunity (Approx 4421 sqm) to make your mark in Milton: Key Features will include: Complete building available for lease with opportunity for naming rights Smaller full floor tenancies also available Large onsite exclusive use car park for tenants and visitors Top quality end of trip facilities Brand new chilled water air conditioning system Excellent access to public transport Flexible floor designs to suit a large variety of tenancy needs. Be one of the first to inspect this exceptional building and call the BNG office today! 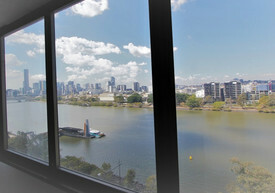 Experience the tranquillity of calming river views from this 184m2 prime Milton office. Tenancy features include: Open Plan Work Area Kitchenette 3 offices (or convert any of these into meeting rooms) Utility Area Separate Server Room End Of Trip Facilities Secure Car Bays The Milton area offers a variety of cafes and restaurants, walking and bicycle tracks, local schools & childcare, and main attractions such as Suncorp Stadium. Call BNG today and book your next inspection with us! This sublease opportunity offers the end user a cost effective tenancy within character filled building close to the City. bull; 134m2 tenancy fitted as pictured, or available as a clean slate. bull; Fully air conditioned bull; Require more natural light? Several windows with leafy outlook available for reinstatement. bull; Signage to Street bull; 1 reserved car park Call Today Located within the Milton precinct, close to all amenities and transport. Only 5 minutes from the CBD. For more information on this unique opportunity or to arrange an inspection please call Juma Marstella on 0450 360 321. Incredible exposure with great incentives 164m2 commercial office space with fit out polished concrete Ground floor air conditioned office Kitchenette, open plan & partitioned offices Fantastic location at corner of Castlemaine Street, direct access to Inner City Bypass and Coronation Drive 2 secure parking spots available Central positioning next to CBD Great cafe's, bars, restaurants, Suncorp Stadium at walking distance Close to public transport including bus, train & ferry Motivated landlord, please Contact Exclusive Agent for an inspection! Milton is an inner suburb of Brisbane, approx. 2 km west of the central business district. The suburb is a mixture of light industry, warehouses, commercial offices, retail and single and multiple occupancy residences. The main roads are Milton Road and Coronation Drive. 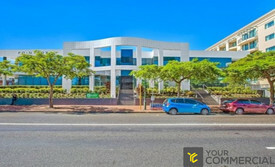 Reception/waiting area 262 SQM office Secure swipe access reader 32 workstations 1 x office Utilities/server area, kitchen Dual roller blinds Outgoings included in rental This premium office tenancy is located on the 4th floor and has extensive western views to Mt Coot tha. The turn key fitout is less than 4 years old, with all workstations cabled up ready to use. The building has excellent staff amenities including on site cafÃ© and end of trip facilities lockers, showers & secure bike parking. Available Now! For more information please contact Tony Morena. Approximate If Applicable. Central Location | Abundance Of Natural Light | Free Meeting Rooms $690pw | 6 Person Workspa..
PROPERTY OVERVIEW $690pw Price incl. Dedicated desks for rent in a Milton office that showcases floor to ceiling views of Brisbane’s fantastic mountains, river and cityscape. Beanbags, breakout areas and brilliant natural light – this newly renovated office space has it all and offers a relaxed place to create, innovate and thrive. The office has Wi Fi, whiteboards, a kitchen and all standard office amenities as it hits just the right mark between casual creativity and business professionalism. As if that’s not enough, you can impress your network by hosting conferences in the adjoining Milton House before letting work meet play with unlimited access to a tennis court, swimming pool and BBQ area. There are 10 desks for rent at this office which can be rented individually or together for great flexibility. Amazing perks at a low cost – this Milton office space is one of the best offerings in the area right now. Kings Row is a stunning Grade A development of modern light filled office space and world class facilities including bike racks, lockers, showers and changing rooms with a free towel service. It’s fully air conditioned for the comfort of its tenants and is accessible 24/7 so you can work when it fits in with your lifestyle. The five floor building offers direct access to Coronation Drive from the ground floor with a bus stop adjacent to the front door. It’s attached to the historical Milton House, the original homestead for the area dating back to 1850, which offers conference facilities, meeting spaces and incredible lifestyle facilities of a pool, tennis court and BBQ area. Located just 350m from Milton Station among Milton’s best cafes and conveniences and only 2.2km along the Bicentennial Bikeway to Brisbane CBD, this coworking office boasts a tranquil environment that’s still close to the action of the city. The advertised office space is perfect for a team of 6. If you need more or less space, we have over 30,000 furnished workspaces all over the world suitable for a team of 1 to 200+. Our award winning team offer a free service that will help you find the perfect solution for your needs, so reach out if you need more help. What you get for your weekly rent , 24/7 Access , Access to internal breakout areas , Access to kitchen facilities , Access to secure printer and scanner , Building outgoings included , Electricity usage included , FREE use of the meeting rooms , Lockable storage unit , One simple bill for everything related to your workspace , Plug and play furnished workspace , Regular cleaning , Secure high speed Internet Building features , Abundance of natural light , Air conditioning , Car parking in building (Paid) , Creative co working space , Disabled access and facilities , New fit out , Print, scan and copy facilities , Taxi / Uber stand close to building 350m to Milton Train Station 270m to Milton Markets 500m to Milton Ferry Terminal 2.2km to Brisbane CBD Close access to the Bicentennial Bikeway WHO IS OFFICE HUB? Office Hub has largest collection of shared office space, sublet office space, creative coworking office space and serviced offices, perfect for 1 200 employees. Let us take you on a tour of all the spaces that fit your needs and budget. Our service is complimentary and we work for you and the landlord to negotiate the most competitive deal in the market. Let us show you how shared and serviced offices can be the perfect solution for your business. www.office hub.com.au www.office hub.co.nz Conditions apply A portion of the square meterage factors in access to shared space. The advertised price includes any incentives offered based on a 12 month agreement. If a shorter period is agreed to please note the price may increase accordingly. This promotional offer for new tenants only and may be withdrawn at any time due to space availability. Get in quick this building is almost at capacity with this being the only full floor tenancy available in the highly sought after Milton property. Boasting great natural light, excellent staff amenities and an onsite cafe. Conveniently situated on Coronation Drive with easy access to all modes of public transport. Cafes and restaurants a short walk away and Suncorp stadium nearby for all your entertainment needs. 6 large offices Large boardroom Meeting room Kitchen with river views Reception area 34 desks Store room Large server room Dual entry Exclusive use toilets Outgoings included in rental Available now! Approximate If Applicable For more information please contact Tony Morena. Level 6 Office Suite Call Agent for Latest Pri..
139 m2 modern office space Reception/waiting area Open plan work space Kitchenette 4 x offices Boardroom Air conditioning 3 x lifts CCTV 3 phase power fibre optics Great outlook Excellent parking ratio Close proximity to rail, bus ferry public transport Directly opposite new ferry terminal at Park Rd Located on level 6 with views to Milton. This building has excellent staff amenities including end of trip facilities with lockers, s howers and secure bike parking. Onsite building management for hassle free leasing. Call The Commercial Guys today to book your inspection or for further information. Unless otherwise stated, the price/property may be subject to GST and/or outgoings. 142 m2 6th floor office space Utilize current fit out or take as open plan ready for brand new fitout Current fit out includes: Entry/waiting area 2 x sizable offices Open plan work space Boardroom Large kitchen storeroom Option to take neighbouring tenancy creating a combined area of 281m2 Building Features Include: Great natural light Generous staff and visitor parking On site Management End of trip facilities Remodeled foyer Excellent security features including swipe access to all amenities and CCTV cameras Located on Level 6 with amazing views that extend out towards Brisbane CBD stretch over the Brisbane River. Call The Commercial Guys today to book your inspection or for further information. Unless otherwise stated, the price/property may be subject to GST and/or outgoings. Sought-after Ground Floor Tenancy Call Agent Today! 107 m2 suite First time offered in years On offer with current fit out in place (until Nov18) Featuring secure private reception, private offices open plan work space Highly sought after location First rate amenities with on site coffee shop, end of trip facilities on site management Direct access to the Brisbane cycleway network Brisbane Airport via the Inner City Bypass/Airport Tunnel 20 min away Milton train station (700m), bus stop (on doorstep) City Cat / ferry stop (50m) Call The Commercial Guys today to book your inspection or for further information. Unless otherwise stated, the price/property may be subject to GST and/or outgoings. Full Floor Vacancy With Panoramic River View Call Agent for Latest Pri..
668 m2 full floor office suite 6 large offices Large boardroom Meeting room Kitchen with river views Reception area 34 desks Store room Large server room Dual entry Exclusive use toilets Get in quick as this building is almost at capacity with this being the only full floor tenancy available in this highly sought after Milton property. 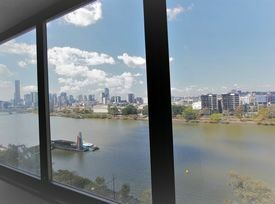 301 Coronation Drive is situated in a premium office tower adjacent to the Brisbane River. With an on site coffee shop and direct access to the Brisbane cycleway network 301 Coronation Drive is the place to work. 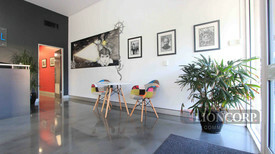 This A+ location is only 20 minutes by car to the Brisbane Airport via the Inner City Bypass/Airport Tunnel, a short walk to public transport Milton train station (600m), bus stop (on doorstep), City Cat / ferry stop (50m), a short walk to Suncorp Stadium, host to major sporting and entertainment events. Call The Commercial Guys today to book your inspection or for further information. Unless otherwise stated, the price/property may be subject to GST and/or outgoings. 5 Executive offices with reception and open plan area Modern kitchenette and amenities Abundance of natural light Air conditioning and alarm system 3 car spaces available Central location in tightly held Park Rd precinct For more information or to arrange an inspection please contact Richardson Wrench Commercial Brisbane North. Turn Key & Multiple Sizes Ready To Go! Available NOW! Ground floor 104sqm Level 4 262sqm, $475sqm gross Level 6 139sqm, $430sqm gross Level 6 142sqm, $430sqm gross Car parking available at 1:50sqm Well designed fit out including reception/waiting area, open plan working area, kitchenette, 4 x offices and boardroom Great natural light Views over Milton End of use facilities including secure bicycle parking, lockers and showers Onsite building management Landmark building Conveniently located for Milton business district, walking distance to rail, bus and ferry transport and 5 minute drive to CBD Air conditioning and 3 x lifts 3 phase power and fibre optics Please call Your Commercial to arrange an inspection. Well designed fitout in place including reception/waiting area, open plan working area, kitchenette, 4 x offices and boardroom. Excellent staff amenities End of trip facilities with lockers, showers And Secure bike parking Onsite building management making tenure here hassle free.